Growth of N deficient plants is slow. Leaves are pale green and older leaves turn yellow and die early. As N is mobile in plants, older leaves are the first to show N deficiency symptoms [N37, N39]. The leaves of the N deficient seedling on the right are pale green and much smaller (photo taken by Patricia Lazicki). 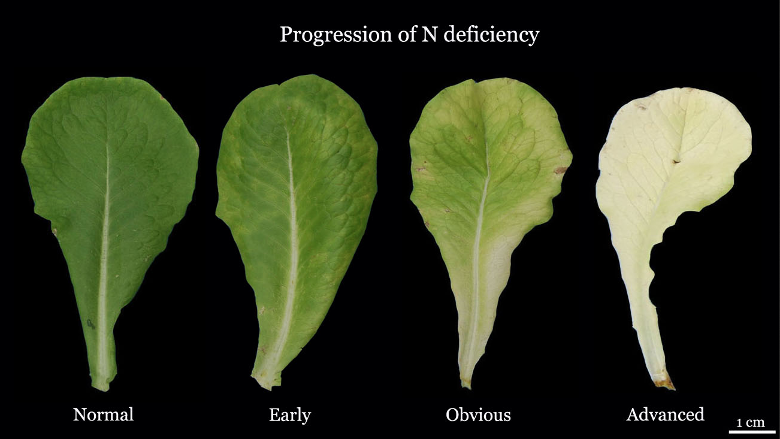 Progression of N deficiency symptoms on lettuce leaves (photo provided by the International Plant Nutrition Institute). Application of moderate rates of N and P enhance postharvest quality. However, high P and N application rates increase the sugar content, which in turn can increase the severity of bacterial diseases, reducing the shelf life of lettuce [N19]. High soil nitrate concentrations may also increase the occurrence of corky roots [N38]. Samples are taken from the top foot of the soil profile, which is the major rooting zone for lettuce [N20, N21]. Zones of recently banded fertilizer applications should be avoided so that the N availability is not over-estimated [N11]. For more information on sampling procedure see Sampling for Soil Nitrate Determination). Young lettuce plants require little N, as approximately 70% of the total N is taken up between heading and harvest [N21, N30, N33, N41]. Therefore, taking a soil sample after thinning, prior to the first in-season N application, and a second 2-3 weeks later provides sufficient information to schedule N applications throughout the season [N13]. Soil samples can be sent to a laboratory or extracted and analyzed on the farm. The soil nitrate quick test with colorimetric test strips is highly correlated with the standard laboratory technique and has been found to be a reliable estimate of current soil N status. Although the quick test is less accurate than a standard laboratory analysis, its accuracy is generally sufficient for routine on-farm use when done correctly. With the quick test, soil nitrate can be determined in a timely manner in order to make N fertilization decisions [N14, N15]. For the soil nitrate quick test, 30 mL of a of a calcium chloride (0.01 M) or an aluminum sulfate (0.025 M) solution are measured into a clean 2-oz bottle or a centrifuge tube with a mark at 40 mL. Field moist soil is added until the extractant reaches the mark. The tube is then capped and vigorously shaken for about 1 minute to disperse all the aggregates. The soil particles are allowed to settle until clear supernatant forms. The nitrate concentration in the supernatant can be measured with nitrate-sensitive colorimetric test papers [N14, N15]. More detailed instructions can be found here. Several studies carried out in commercial fields in the Salinas Valley found that no fertilizer N is necessary when the pre-sidedress nitrate-N level in the soil is above 20 mg/kg (= 20 ppm) [N3, N5, N10, N15]. A concentration of 20 ppm nitrate-N in the top foot of soil equals approximately 80 lbs N/acre. In the absence of leaching, this amount of N could supply a crop for at least 2 weeks, even at peak N demand [N12]. If the nitrate-N concentration in the soil is below 20 ppm, only enough N to increase soil available nitrate-N to 20 ppm is needed (see Sidedress N). Contact your local farm advisor for more information. The nutrient concentration is determined in the youngest wrapper leaf. A minimum of 20 leaves should be collected, each from a different healthy plant of representative vigor [N12]. Samples are taken from the entire field. Variable fields should be divided into uniform blocks, which are sampled separately [N12]. It is important to accurately determine the crop growth stage since the total N concentration declines as crops develop. Once tissue samples are collected, they should be dried as quickly as possible [N12]. For more information on sampling procedure see Plant Tissue Sampling. Hartz and coworkers [N16] developed optimum leaf nutrient ranges for iceberg and romaine lettuce based on a survey of 78 commercial fields in the coastal valleys of central California (see Table). The optimum nutrient concentrations can be considered sufficient for high-yield production. As the values were obtained from fields with generally high N and P inputs, values below the optimum range for these two nutrients may not limit yield [N16]. Contact your local farm advisor for more information. 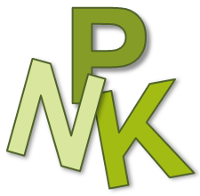 Optimum N, P and K concentrations of whole leaf samples [N16]. Compared to the values presented in the table, earlier work suggested slightly lower optimum N levels of 3.0-4.0% at early heading and 2.5-3.0% pre-harvest [N6]. Whole leaf total N can be used to determine whether N availability has been adequate to date. Leaf N concentrations below the sufficiency level suggest that soil N availability may be limited and fertilization may be beneficial [N12]. However, leaf N and midrib nitrate analyses are relatively insensitive indicators of excess soil N availability [N11, N12, N15, N25]. In addition, cultivar and field specific factors can confound the relationship between N availability and tissue N concentration [N11]. Therefore, sidedress N decisions should not be based solely on tissue analyses. In a recent study, Bottoms and coworkers [N2] found that whole plant N was a robust measure of N sufficiency. Their study suggested a pre-heading critical threshold of 4% N.
Pre-plant N applied in fall at bed listing is highly susceptible to leaching below the root zone by winter rain [N27]. Stone [N31] found that lettuce receiving starter and sidedress N outperformed lettuce that received a broadcast N application before seedbed preparation [N31]. In addition, lettuce requires little N in the early phase of growth. Studies found that N uptake during the first month after planting represented no more than 20% of total uptake [N21, N27, N30]. The optimal pre-plant application rate depends on residual soil nitrate-N. When the residual nitrate-N concentration exceeds 20 ppm, no pre-plant N application is required. When the residual soil nitrate-N concentration is lower, a small application of 20-40 lbs/acre just before or at planting is sufficient to cover the early N needs. To ensure that N is available in the root zone of young plants, the irrigation management should be optimized to limit nitrate movement below the root zone. High application rates not only increase the risk of N losses, but may also damage seedlings. Studies in the Imperial Valley showed that pre-plant or starter ammonium-N application exceeding 50-60 lbs/acre may damage seedlings resulting in uneven growth [N35]. Lettuce requires little N in the early phase of growth. Studies found that N uptake during the first month after planting represented no more than 20% of total uptake [N21, N27, N30]. For this reason, large application rates before or at planting are not needed and only increase the risk of nitrate leaching below the root zone [N41]. The starter application rate depends on residual soil nitrate-N. When the residual nitrate-N concentration exceeds 20 ppm, no starter N application is required. When the residual soil nitrate-N concentration is lower and no pre-plant N has been added, about 20 lbs N/acre are applied at planting, while the rest is applied at sidedressing [N29, N34]. Contact your local farm advisor for more information. To ensure that N is available in the root zone of young plants, the irrigation management needs to be optimized to prevent nitrate movement below the root zone. The fertilizer band is generally placed two inches below and two inches to the side of the seed row [N19, N22, N35]. At planting, nutrients are often applied in the form of an anti-crustant which contains P and sometimes N [N18]. The amount of nutrients applied with the anti-crustant needs to subtracted from the total fertilizer requirements. Between heading and harvest, N demand of lettuce is high, reaching 3-4 lbs N/acre per day [N13, N32, N33]. During this period, which is generally the last month before harvest, 70-80% of total N is taken up [N21, N30, N33, N41]. A sufficient N supply between heading and harvest is crucial for obtaining a high yield. When leaching losses are minimized, the seasonal N application rates for lettuce should not exceed 150-180 lbs/acre for winter and spring production and 100-140 lbs/acre for summer and fall production. However, the required N rate depends on the residual soil nitrate content. Crops produced from late fall through early spring generally require more fertilizer N because the residual soil N content tends to be lower during this period compared to the summer months [N12]. Several studies carried out in commercial fields in the Salinas Valley found that when the pre-sidedress soil nitrate-N level is above 20 mg/kg (= 20 ppm), no fertilizer N is necessary [N2, N3, N5, N10, N15]. If the soil nitrate-N concentration is below 20 ppm, only enough N to increase soil available nitrate-N to 20 ppm is needed. Approximately 4 lbs N/acre need to be added to increase the soil nitrate level by 1 ppm [N15]. As an example, when the soil nitrate-N concentration is 15 ppm, 20 lbs N/acre (4 lbs x 5 ppm) are needed to increase the level to 20 ppm. This approach has been successfully used in iceberg and romaine lettuce [N3, N5, N10]. In addition to residual soil nitrate, nitrate in the irrigation water should be accounted for to reduce the amount of N fertilizer applied. Nitrogen mineralization from soil organic matter and crop residues also add available soil N. Net N mineralization is generally higher after broccoli or cauliflower than after lettuce [N12] (see Factors Affecting Soil Nitrate Concentrations in Spring). These factors are taken into account by CropManage, a web-based irrigation and N management software tool developed by Cahn and coworkers[N4]. CropManage can be accessed here. Sidedress N should be applied at a distance of at least 2-3 inches from the plant to avoid root damage from high salt concentrations in the band. Even at this distance, root burn of young lettuce plants has been observed in soils with a high clay content [N28]. A number of studies have compared different N fertilizers, such as ammonium sulfate, calcium nitrate, urea, ammonium nitrate, and potassium nitrate. In general, the effect of N form on lettuce yield and quality has been found to be small [N1, N7, N8, N26, N40]. In one study, panelists rated the crunchiness of lettuce fertilized with calcium nitrate highest [N26]. This effect was most likely the result of the increased calcium supply [N24] and may be minimal in Salinas Valley soils where calcium availablity is generally adequate [N17]. High application rates of ammonium fertilizers may cause root damage. Symptoms of root damage are generally more pronounced in cold, waterlogged soils [N9]. Plants suffering from ammonia toxicity wilt during the day. The older leaves may turn yellow and die. The central core of the taproot first turns yellow, then brown and finally dark brown to red [N23]. When the pre-sidedress soil nitrate-N concentration is below 20 ppm, the first sidedress N application is done after thinning at the two- to four-leaf-stage. If the residual nitrate-N concentration drops below 20 ppm, a second application is done 2-4 weeks later at the cupping stage [N3, N15]. Some growers apply 10-15 lbs N/acre 7 to 10 days prior to harvest to assure that the crop color and growth rate are optimal [N29, N34]. The decision whether to apply late-season N should also depend on the residual nitrate-N level. Furthermore, in sprinkler or furrow-irrigated fields the uniformity of such applications is typically poor and the danger of loss to the environment in runoff is high. For these irrigation methods, late-season, water-run applications should be avoided [N36]. For more information contact your local farm advisor. Early symptoms of P deficiency include a dull green appearance of the plant. Phosphorus deficiency results in reduced plant growth and leaf size. Symptoms may also include irregular, necrotic spots along leaf margins and purple to red pigmentation of leaf margins and stems. As P is mobile in the plant, symptoms first appear in older leaves [P16, P17]. Purpel color of older leaves is a sign of P deficiency. (photo provided by the International Plant Nutrition Institute). Application of moderate rates of N and P enhanced postharvest quality. However, high P and N application rates increase the sugar content, which can increase the severity of bacterial diseases and reduces the shelf life of lettuce [P5]. In lettuce, soil samples for P analyses are generally taken from the top foot of the profile, which is the major rooting zone [P15]. In a field experiment, Murakami and coworkers [P10] found approximately 80% of the root length in the top foot of the profile at harvest. In a field study in the Salinas Valley, Jackson and coworkers [P7] reported much lower loot densities below a depth of 6 inches compared to the topsoil. Even though some roots may reach a depth of 18 inches or lower, the root system of lettuce is considered shallow [P6, P7]. Phosphorus availability is generally determined by extracting soil samples with a bicarbonate solution (Olsen-P). In a study carried out at different sites in the Salinas Valley, Johnstone and coworkers [P8] showed that bicarbonate extractable P is an accurate reflection of available P in neutral to alkaline soils. Little is known about the accuracy of the Olsen soil P test for lettuce production in soils with a pH below 6.2. Bicarbonate extractable P concentrations above 60 ppm are considered high (see Table). In these soils, a yield response to P fertilizer is unlikely [P8, P15]. At intermediate P levels, small starter application rates may have a positive effect, especially in winter and spring when soil temperature is low (see Starter P). Higher application rates may be necessary for fields with low P availability (see Pre-plant P). Interpretation of P and K soil test levels in the top foot of the soil profile [P15]. The nutrient concentration is determined in the youngest wrapper leaf. A minimum of 20 leaves should be collected, each from a different healthy plant of representative vigor [P3]. Samples are taken from the entire field. Fields exhibiting spatially variable soil properties or yield should be divided into uniform blocks, which are sampled separately [P3]. It is important to accurately determine the crop growth stage since total P concentration declines as lettuce develops. Once tissue samples are collected they should be dried as quickly as possible [P3]. For more information on sampling procedure see Plant Tissue Sampling. Hartz and coworkers [P4] developed optimum leaf nutrient ranges for iceberg and romaine lettuce based on a survey of 78 commercial fields in the coastal valleys of central California (see Table). The optimum nutrient concentrations can be considered sufficient for high-yield production. As the values were obtained from fields with generally high N and P inputs, values below the optimum range for these two nutrients may not limit yield [P4]. For more information contact your local farm advisor. Optimum N, P and K concentrations of whole leaf samples [P4]. Earlier work suggested similar optimum P levels of 0.4-0.85% at early heading and 0.35-0.8% pre-harvest [P1]. For midrib samples, a sufficiency level of 0.25% P appears appropriate [P8]. Due to the short growth cycle of lettuce, tissue P analyses are more valuable as a planning tool for succeeding crops than as a management tool for the current crop [P8]. Phosphorus application rates should be based on soil test results. When large amounts are needed, P is commonly applied pre-plant, while smaller quantities are best applied as starter. Up to 90 lbs P/acre (200 lbs P2O5/acre) may be needed to maximize lettuce growth in soils with a bicarbonate extractable P level below 10 ppm, especially when lettuce is planted during the winter and spring when the soil temperature is below 60 °F [P15]. Fields with soil test P levels between 30 and 40 ppm should not require more than 45 lbs P/acre (100 lbs P2O5/acre)[P15]. For more information contact your local farm advisor. When soil test P levels are above 40 ppm, only small amounts of P are required which are best applied as starter (see Starter P). In general, band applications are more effective than broadcast applications [P11, P12]. The fertilizer band is generally placed some two inches below and two inches to the side of the seed row [P5, P9, P14]. Especially fertilizers with a high nutrient concentration, e.g. 10-34-0 or 11-52-0, need to be banded at a safe distance to the developing plants. These fertilizers can inhibit seedlings because of the concentrated salts they contain [P15]. Broadcast P fertilizer needs to be disked into the soil because P is immobile in the soil. Leaving P on the surface results in lower uptake because the surface soil periodically dries out, which reduces the root density near the soil surface. Phosphoric acid-based fertilizers are commonly used as anti-crustants. At normal use rates, these fertilizers do not damage the developing seedlings and can be an efficient way to provide a substantial proportion of the P required by lettuce plants[P15]. A number of granular and liquid P fertilizers are available. At high application rates, blends containing ammonium, such as ammonium phosphate (11-48-0), may damage seedlings [P14]. Fact sheets of the most common fertilizers can be found on the web site of the International Plant Nutrition Institute. Phosphorus application rates should be based on soil test results. The need for P fertilizer further depends on soil temperature, as cool soil temperatures decrease P availability [P2, P8]. Phosphorus applied with an anti-crustant needs to be subtracted from the total P fertilizer requirement. For lettuce planted in winter or spring, a low starter application of 20 lbs P2O5/acre (9 lbs P/acre) may be most appropriate when soil test levels are between 40 and 55-60 ppm [P12, P13]. This application rate corresponds to the amount of P removed with marketable heads [P8]. For summer production, the threshold at which P fertilization is beneficial is approximately 40 ppm [P8]. For more information contact your local farm advisor. Banding P fertilizer some two inches below and two inches to the side of the seed row generally provides the best results [P5, P9, P14]. Leaves of K deficient plants are dark green. Older leaves have marginal and interveinal scorch (spots of dead tissue) [K14]. Since K is mobile in the plant, deficiency symptoms appear first on the oldest leaves. Potassium deficient lettuce leaves (photo provided by the International Plant Nutrition Institute). Potassium application rates far in excess of plant demand may interfere with magnesium uptake [K7]. In lettuce, soil samples for K analyses are generally taken from the top foot of the profile, which is the major rooting zone [K12]. In a field experiment, Murakami and coworkers [K10] found approximately 80% of the root length in the top foot of the soil profile at harvest. In a field study in the Salinas Valley, Jackson and coworkers [K9] reported much lower root densities below a depth of 6 inches compared to the top 6 inches. Even though some roots may reach a depth of 18 inches or lower, the root system of lettuce is considered shallow [K8, K9]. To determine the plant available K, soil samples are most often extracted with an ammonium acetate solution. With soil K test values above 150 ppm, K fertilization is not required as lettuce is unlikely to respond (see Table) [K12]. With an intermediate K availability of 100 to 150 ppm, a yield response is possible. However, in a study carried out in Salinas, a K application rate of 60 lbs/acre did not significantly affect yield in a soil with K test values of approximately 100-120 ppm [K4]. With intermediate soil test values, the tissue analysis may indicate whether K fertilization may be beneficial. Lettuce grown in a field with a low soil K test value will likely respond to K fertilization. For more information contact your local farm advisor. Interpretation of P and K soil test levels in the top foot of the soil profile [K12] . The nutrient concentration is determined in the youngest wrapper leaf. A minimum of 20 leaves should be collected, each from a different healthy plant of representative vigor [K2]. Samples are taken from the entire field. Fields exhibiting spatially variable soil properties or yield should be divided into uniform blocks, which are sampled separately [K2]. It is important to accurately determine the crop growth stage since total K concentrations change as crops develop. Once tissue samples are collected they should be dried as quickly as possible [K2]. For more information on sampling procedure see Plant Tissue Sampling. Hartz and coworkers [K3] developed optimum leaf nutrient ranges for iceberg and romaine lettuce based on a survey of 78 commercial fields in the coastal valleys of central California (see Table). The optimum nutrient concentrations can be considered sufficient for high-yield production [K3]. Optimum N, P and K concentrations of whole leaf samples [K3]. Earlier work suggested similar optimum K levels of 3.0-4.0% at early heading and 3.0-5.0% pre-harvest [K1]. The K application rate should be based on soil test results and leaf analyses. With soil K test values above 150 ppm, K fertilization is not required as lettuce will likely not respond to K fertilization. With an intermediate K availability (100-150 ppm), a positive yield response is possible. When the leaf analysis indicates that K availability is low, applying the amount of K removed with harvested lettuce should be adequate. Between 60 and 90 lbs K/acre (70 -110 lbs K2O /acre) are removed with the harvested lettuce, assuming a yield of 350-400 cwt/acre [K13], a K concentration in the dry matter of the leaves ranging from 3.5 to 4.3% [K4, K11] , and a moisture content of 95% [K5]. In fields with low K soil test values, the application rate may be increased, especially when leaf analyses indicate that K supply is insufficient. A higher application rate may also be necessary in very sandy soils where K leaching may reduce the amount of available K. For more information contact your local farm advisor. Potassium fertilizers are most commonly applied pre-plant. Pre-plant applications can be broadcast and incorporated into the soil or banded. In drip irrigated fields, K can also be fertigated during the growing season. As is the case with N, lettuce takes up most of the K during the second half of its growth cycle [K11]. In hydroponically grown lettuce, Inthichack and coworkers[ K7] did not find a significant difference in yield between KCl and K2SO4 at application rates needed to maximize yields. Lettuce fertilized with K2SO4 was found to be more prone to tipburn than plants fertilized with KCl; however, this was only evident at application rates exceeding the rates needed to obtain maximum yield [K7]. For fertigation, KCl is generally preferred over K2SO4 due to its higher solubility [K6]. Abu-Rayyan, A., Khraiwesh, B.H., Al-Ismail K., 2004. 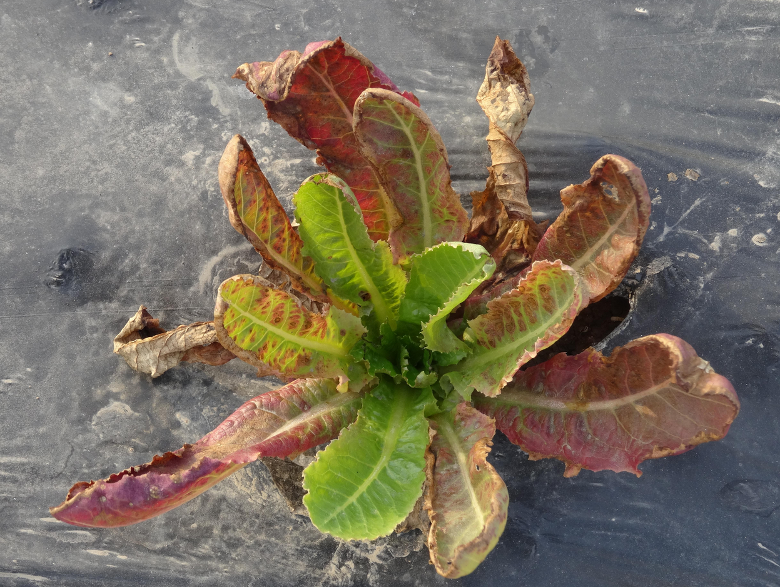 Nitrate content in lettuce (Lactuca sativa L.) heads in relation to plant spacing, nitrogen form and irrigation level. Journal of the Science of Food and Agriculture 84, 931–936. Bottoms, T.G., Smith, R.F., Cahn, M.D., Hartz, T.K., 2012. Nitrogen requirements and N status determination if lettuce. HortScience 47, 1768-1774. Breschini, S.J., Hartz, T.K., 2002. Presidedress soil nitrate testing reduces nitrogen fertilizer use and nitrate leaching hazard in lettuce production. HortScience 37, 1061-1064. Cahn, M., Smith, R., 2010. Summary of 2008-09 large scale irrigation and nitrogen fertilizer management trials in lettuce. UCCE Monterey County Crop Notes March/April 2010, 5-9. Chohura, P., Kolota E., 2011. Effect of differentiated nitrogen fertilization on the yield and quality of leaf lettuce. Folia Horticulturae 23, 61-66. Gardner, B.R., Pew, D.W., 1979. 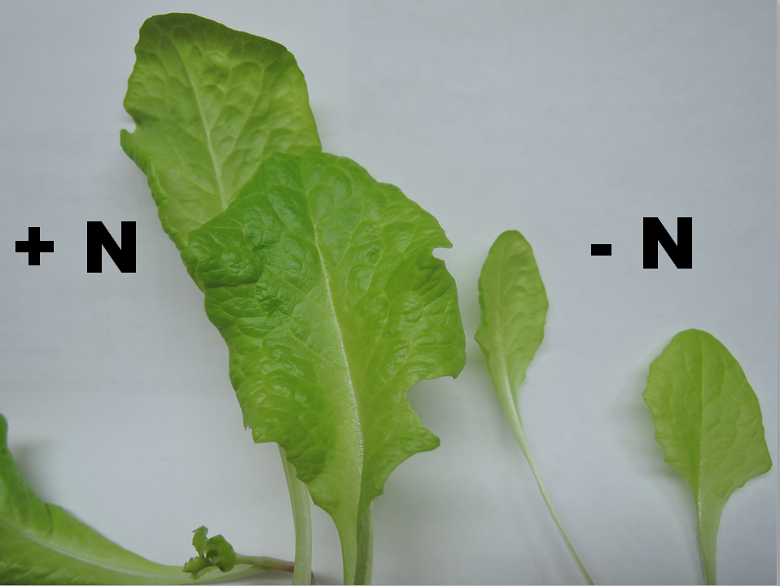 Comparison of various nitrogen sources for the fertilization of winter-grown head lettuce. Journal of the American Society for Horticultural Science 104, 534-536. Grogan, R.G., Zink, F.W., 1956. Fertilizer injury to lettuce. California Agriculture 10 (12), 5-16. Hartz, T., 2003. Demonstration of presidedress soil nitrate testing as an N management tool. FREP Final Report. Hartz, T.K., Smith, R.F., Schulbach, K.F., LeStrange, M., 1994. On-farm nitrogen tests improve fertilizer efficiency, protect groundwater. California Agriculture 48, 29-32. Hartz, T.K., Johnstone, P.R., Williams, E., Smith, R.F., 2007a. Establishing lettuce leaf nutrient optimum ranges through DRIS analysis. HortScience 42, 143–146. Hartz, T.K., Johnstone, P.R., Smith, R.F., Cahn, M.D., 2007b. Soil calcium status unrelated to tipburn of romaine lettuce. HortScience 42, 1681–1684. Hoque, M.M., Ajwa, H., Othman, M., Smith, R., Cahn, M., 2010. Yield and postharvest quality of lettuce in response to nitrogen, phosphorus, and potassium fertilizers. HortScience 45, 1539-1544. Jackson, L.E., 1995. Root architecture in cultivated and wild lettuce (Lactuca spp.). Plant, Cell and Environment 18, 885-894. Jackson, L.E., Stivers, L.J., Warden, B.T., Tanji, K.K., 1994. Crop nitrogen utilization and soil nitrate loss in a lettuce field. Fertilizer Research 37, 93-105. Koike, S., 2011. Wilting lettuce plants damaged by soil and wind factors. Newman, J.M., Hilton, H.W., Clifford, S.C., Smith, A.C., 2005. The mechanical properties of lettuce: A comparison of some agronomic and postharvest effects. Journal of Materials Science 40, 1101–1104. Simonne, E., Simonne, A., Wells, L., 2001. Nitrogen source affects crunchiness, but not lettuce yield. Journal of Plant Nutrition 24, 743-751. Smith, R., 2011. Fertilizer burn issues on lettuce. Salinas Valley Agriculture. Smith, R., Cahn, M., Daugovish, O., Koike, S., Natwick, E., Smith, H., Subbarao, K., Takele, E., Turini, T., 2011. Leaf lettuce production in California. UC ANR Publication 7216. Sosa, A., Padilla, J., Ortiz J., Etchevers, J.D., 2012. Biomass accumulation and its relationship with the demand and concentration of nitrogen, phosphorus, and potassium in lettuce. Communications in Soil Science and Plant Analysis 43, 121-133. Stone, D.A., 2000. The effects of starter fertilizers on the growth and nitrogen use efficiency of onion and lettuce. Soil Use and Management 16, 42-48. Thompson T.L., Doerge T.A., 1995. Nitrogen and water rates for subsurface trickle-irrigated romaine lettuce. HortScience 30, 1233-1237. Thompson T.L., Doerge T.A., 1996. Nitrogen and water interactions in subsurface trickle-irrigated leaf lettuce: I. Plant response. Soil Science Society of America Journal 60, 163-168. Turini, T., Cahn, M., Cantwell, M., Jackson, L., Koike, S., Natwick, E., Smith, R., Subbarao, K., Takele, E., 2011. Iceberg lettuce production in California. UC ANR Publication 7215. Tyler, K.B., Lorenz, O.A., 1977. Lettuce fertilization. California Iceberg Lettuce Research Program. Annual Report 1976-1977, 24-27. USDA ARS, 2011. Butterhead lettuce (Lactuca sativa var. capitata). Phosphorus deficiency. van Bruggen, A.H.C., Brown, P.R., Greathead, A., 1990. Distinction between infectious and noninfectious corky root of lettuce in relation to nitrogen fertilizer. Journal of the American Society for Horticultural Science 115, 762-770. Wallace, T., 1951. The Diagnosis of Mineral Deficiencies in Plants by Visual Symptoms. His Majesty's Stationary Office, London, UK. Zink, F.W., Yamaguchi, M., 1963. Head lettuce growth and nutrient absorption studies indicate need for re-evaluation of fertilizer practices. California Agriculture 17(6), 13-14. Hartz, T.K., Johnstone, P.R., Williams, E., Smith, R.F., 2007. Establishing lettuce leaf nutrient optimum ranges through DRIS analysis. HortScience, 42, 143–146. Murakami, T., Yamada, K., Yoshida, S., 2002. Root distribution of field-grown crisphead lettuce (Lactuca sativa L.) under different fertilizer and mulch treatment. Soil Science and Plant Nutrition 48, 347-355. Pritchard, K.H., Doerge, T.A., McCreary, T.W., 1994. The response of leaf lettuce to phosphorus fertilizer placement and rate. University of Arizona Vegetable Report 1993, 30-37. Smith, R., Hartz, T., 2008. Phosphorus fertilizer management for lettuce production and water quality protection. UCCE Monterey County Crop Notes November/December 2008, 3-5. Smith, R., Bensen, T., Ajwa, H., Klose, S., 2006. Phosphorus fertilizer evaluations on head lettuce in the Salinas Valley. UCCE Monterey County Crop Notes March/April 2006, 4-5. Hartz, T.K., Johnstone, P.R., Williams, E., Smith, R.F., 2007. Establishing lettuce leaf nutrient optimum ranges through DRIS analysis. HortScience, 42 143–146. Howard, F.D., MacGillivray, J.H., Yamaguchi, M., 1962. Nutrient composition of fresh California grown vegetables. California Agricultural Experiment Station, Bulletin No. 788. Inthichack, P., Nishimura, Y., Yasufumi, F., 2012. Effect of potassium sources and rates on plant growth, mineral absorption, and the incidence of tip burn in cabbage, celery, and lettuce. Horticulture, Environment, and Biotechnology 53, 135-142.